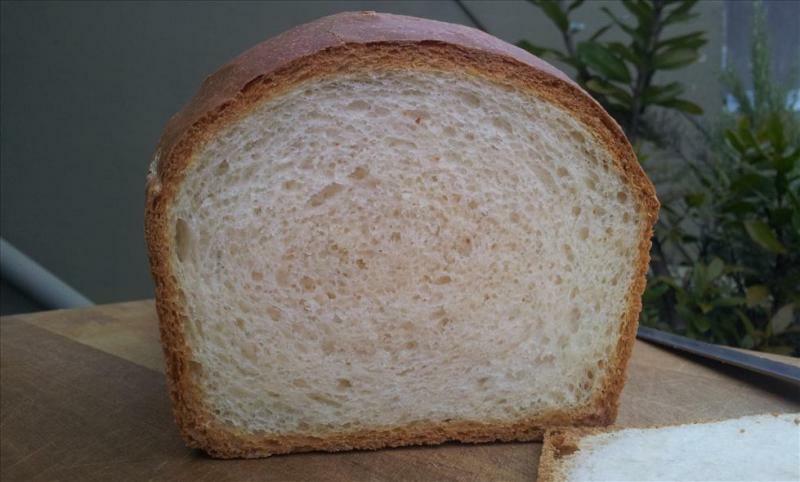 Extremely soft sourdough sandwich bread - the most shreddble, soft, velvety ever! 1. Dough starts to come together, but if you pull a piece, the dough would easily tear, won't form windowpane. 2. Keep kneading, the windowpane gradually starts to form, but it's thick, and won't extend very far. If you poke and get a hole, the edge is rough. 3. keep kneading, the windowpane becomes very extensible. The windowpane is thin but very very tough to break. If you poke a hole (I actually have to use my nail), the edge is smooth. 4. Keep kneading, the windowpane becomes even thinner, more transparent, but it becomes more delicate, easier to poke holes. The edge of the hole is still smooth. 5. 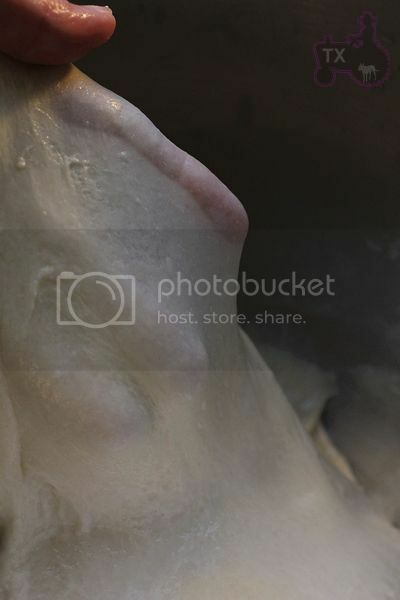 Keep kneading, the dough starts to break down into a puddle of mud. Stage 3 is the "golden point" for creating sandwiches with the best texture, and highest volume. 4 is a little over, your bread will still be high and nice, bu the texture would be a bit rough. Of course it will take a few trail and error to get to that point reliably. In addition, if you are making a sourdough version like I do here, the bulk rise would take a lot longer than the dry yeast version. During this time, the dough is still getting stronger, which means, we need to knead the dough a tiny bit less than stage 3. This time I stopped kneading probably 30secs before it reaches stage 3, and the bread I got is the softest, most shreddable, bounciest I have ever gotten. Note: total flour is 250g, fit my Chinese small-ish pullman pan. 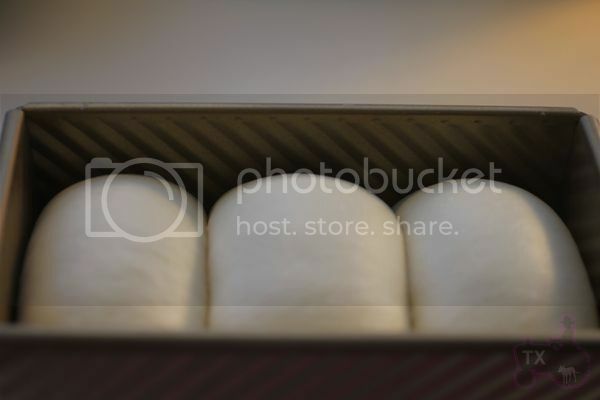 For 8X4 US loaf tin, I suggest to use about 270g of total flour. For KAF 13X4X4 pullman pan, I would suggest using about 430g of total flour. 2. rise at room temp for 2 hours, punch down, put in fridge overnight. 3. takeout, divide, round, rest for 1 hour. shape as instructed here. 4. rise at room temp for about 6 hours. For my pullman pan, it should be about 80% full; for US 8x4inch pan, it should be about one inch above the edge. The dough would have tripled by then, if it can't, your kneading is not enough or over. 5. bake at 350F for 45min. brush with butter when warm. Crumb shots from different parts of the bread, all very velvety soft, with no pores. If your gluten-free friend is wanting to eat this bread, you may want to stick to the original starter-based long ferment version. At the very least, use very little dry yeast and allow a long ferment in a cool area. The long fermentation will make it easier for your friend to handle this bread. I'm sorry it has taken me so long to reply. I've converted your recipe into a yeasted version and updated the size to fit my pan, and have baked about 20-25 loaves so far. I've tweaked the ingredients to suit my own taste as well, but it is still fundamentally the same recipe. Though this is not my best effort, I thought I should post a few pictures. I just wanted to thank you so much. Your tutorials on intensive kneading have absolutely revolutionized my bread baking. I cannot belive how good my homemade sandwich bread is now. It's been a 2-3 year journey, but I'm now officially happy. I must say, I don't believe I've ever achieved a windowpane as good as one of yours. This is probably a combination of poor technique and flour differentiation. We don't get KA in New Zealand, though I've had a Swiss baker tell me that NZ flour is very good quality overall and I buy from the same place as our local bakeries. Regardless, I'm continuing to attempt improvement. I have one question (actually I have a million but I don't want to bother you with too many). I've been making my breads with a poolish, and 3 times I have also tried to ferment them overnight in the fridge. Though I haven't experienced much improvement in taste, I like the convenience of getting a lot of the work out of the way the day before so that I can just prove and bake and have a loaf ready for lunch. But I've noticed that the loaves I put in the fridge don't prove as much. I would say they have about 10% less volume than ones that didn't go in overnight. All three times, the fermenting times at room temp were different. I did an hour, 45 min and 30 min each before S&F and going into the fridge. The crumb does seem to be a bit softer, but of course it's more dense as there is less volume. Every time there were also little bubbles that appear just under the crust of the bread. Can you think of why this would be happening? I know you do a lot of overnight fermenting and I've never seen these bubbles on your loaves or seen you mention less volume. I researched a lot on Google and couldn't find much information or any consencus in the bit that was available. Thank you for this gorgeous recipe. I am trying it for the first time, the recipe almost as given, for myself, and a variation with garlic and herb butter filling as requested by some friends. I spread the filling on the round of dough before rolling it up and putting it in the pans. It is rising beautifully and the oven is preheating. I can't wait to see how it turns out - I'll be thrilled if it is half as lovely as yours looks! Your instructions were fantastic, and the link to the video on kneading was extremely helpful, too. It took me 45 minutes of kneading as per the video to get to a stage 3 which was like Crider described in the post titled 'Experiment' i.e. not so smooth and thin as yours, but extensible and I poked a hole with smooth edges. I haven't tried that particular method of kneading before, but it wasn't too hard to at least approximate it, and it made handling the sticky dough much easier than I could have imagined possible. Thank you again, I'll post again when I see how it has turned out - maybe even with a picture or two! I'm so, so proud of myself! 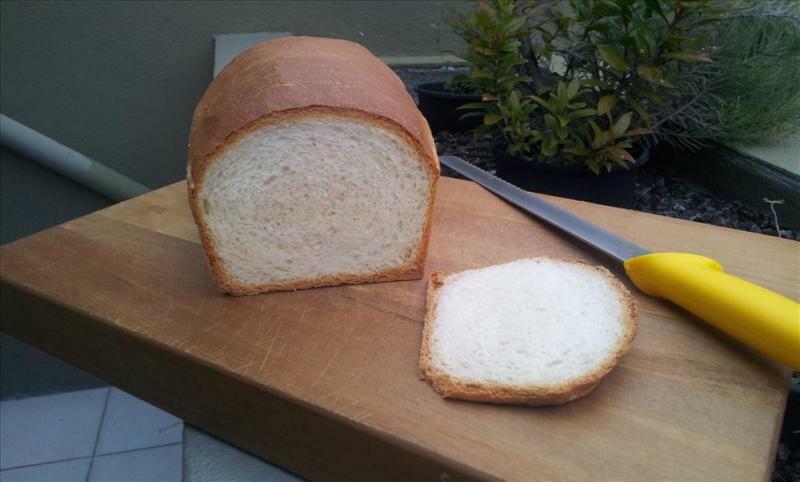 The loaves turned out beautiful - soft, light as air and with a delicate, yet rich flavour! I made two small garlic and herb loaves for my friends and a single large loaf for me. I would post the pictures but I can't work out how to do it! Anyway, thanks again for the fabulous recipe, instructions and link to the kneading video! Hi. I don't know what went wrong... I did everything as said, but when it came to kneading, I found the dough was too runny and wet, more like batter than dough. It wasn't that wet, but it was too wet to handle. What am I doing wrong? I added flour but now I'm afraid that I added too much. And it took me about 2 hours to get to stage 3 by hand kneading. Am I doing something wrong here? I just started my first sourdough starter and am getting all excited about baking my first SD loaf. 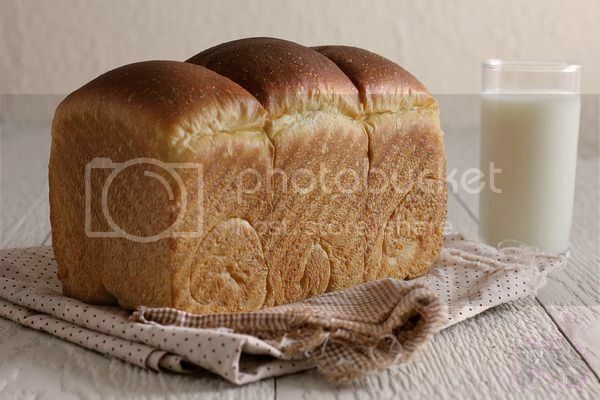 I was showing my 8yo daughter pictures of breads and she kept saying "I don't like bread like that" until I got to this one. She says she will even eat the crust of this one. But the importance on kneading does worry me. I'm a total novice and usually use my bread maker for kneading. Even though it's old and I suspect it often overkneads. You posted a video link in a comment on how to deal with wet dough, but the video is gone. Any other resources you can recommend that can help me? Dear friend. How do you think this recipe would work with some whole wheat flour? I mean, for example, 80% regular flour and 20% whole wheat. In which way this ratio wouldl impact in the fermentation process? Please refer to my blog index the beginning of the post. There are lots of similar 100% ww breads. If you only use <20% ww, expect less volume and similar crumb. I got this to work on my 2nd try. I skipped the levain step though and made a mistake in my conversion for the first dough. And I still wasn't completely satisfied with the oven spring for the final one. But it is soft and fluffy and tastes delicious. My 8yo who has never really liked my homemade bread said this was the first bread she had ever liked on its own. The only issue I had was that I had to hold my 40yo Kenwood Chef when I kneaded on 4 or it would have landed on the floor in no time. Oh and I also found shaping hard because the dough was so slack. Next time I'll roll it between 2 sheets of baking paper. Hi, great bread. I replaced 100g of the white flour with whole Einkorn. It tastes great for tea (5 o'clock here;)). Especially with chocolate cream. For breakfast or dinner (German: Abendbrot, literally evening bread) it still is too sweat. The MOs didn't eat all of the sugar (maybe ignored the fructose part of the sugar?). It is a good base to start my own experiments. Thanks a lot! Here's an image. I couldn't resist to cut it while it was still warm. It was worth it!!! I've been looking for a good recipe to make soft sandwich bread for a while now and this looks amazing, thanks for sharing! I noticed this recipe calls for just milk, whereas this one calls for milk powder + water. Why was the recipe changed from powder and will the type of milk used drastically affect the final product (whole/1%/2%)? 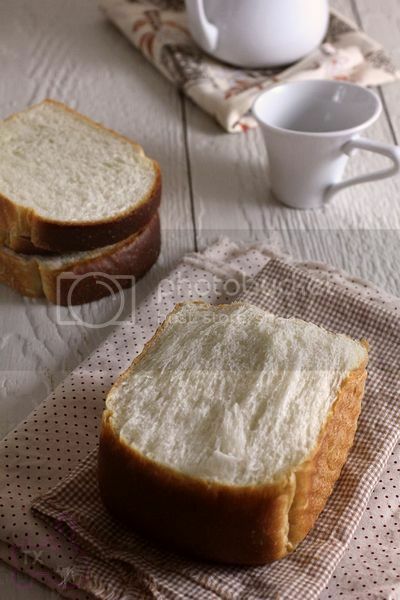 The bread looks delicous! so I've been inspired to try this out. I have mixed the levain per the instructions and it has formed a very firm/dry ball of dough - is this correct? Just saw an older post where you confirm that the levain should be firm! so my question is answered. Loaf is in progress now, will report back with how it turned out. wow wow ! Super! Thank you so much! I m so inspred by your post just reading it and i want to try soon! Thank you! God bless! ive tried this recipe twice now with zero luck. I blame this fully on my lack of experience. both share similar traits in there failed state. Best at way I can explain is that when I finally get the window pane as pictured the dough is very much like silly putty in texture and it never rises. 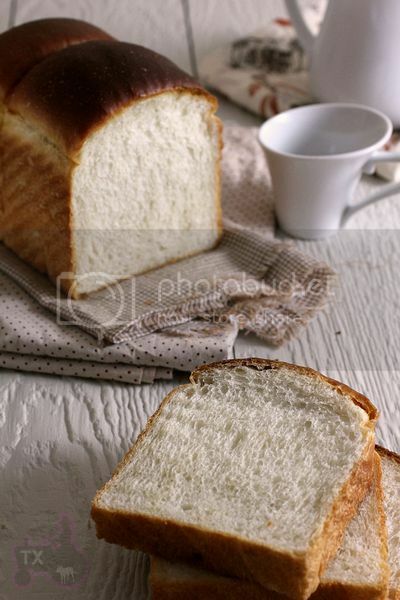 I use my sour dough frequently for other things so I am fairly sure I have a good well kept starter But I just seem to miss on this and white bread is one of my favorite foods so I'm excited to get it right. I'm going to try to replace the starter with yeast and see how it goes. I have pictures of needed. Great formula!, I have started using this in my Bakery. We mix a 20 / 2-lb batch at a time. We also use a double hydration move when mixing. When I first made this in a larger batch, I had to scrap down the bowl and work this dough for over 25 minutes to get it to the correct development. Double hydration is key for the larger batch. Thanks for a great Formula! Could you help me out? I'm having a hard time converting it to percentages. I think the starter and hydration with the egg whites are throwing me off. has anyone tried this successfully with freshly ground whole wheat flour? I have been around for awhile but I haven't had the chance to bake much in the past couple of years, due the limited space we are in at this moment (kitchen is Barby dool size!!). Just recently revived my SD and getting back to work with it. My major disappointment was to only be able to produce hard crust bread, which I am more than happy with since I am Italian and I do love my bread crusty! But my family enjoys a more soft bread especially for every day sandwiches. You bread is just what I was dreaming of, you are a genius and I can't thank you enough for all the work you put into your creations! 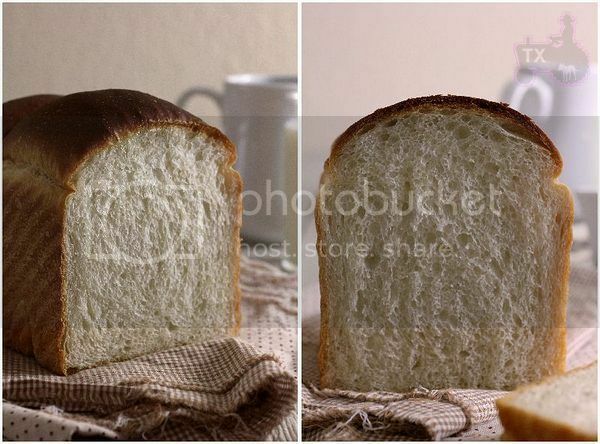 The loaf came beautifully soft and with a slight tang, not overwhelming which I find a positive trait. 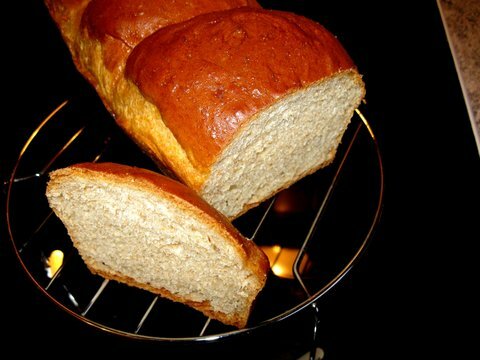 I have made Shokupan (sp) or milk Asian bread in the past, and was very very impressed with the type of great the produces, but I felt I would have love it better if I could use my SD instead of yeast. My goal is to be able to use exclusivley SD for all of my baking, and your blog and recipes are what I was looking for. Hi, I'm not sure TXFarmer is even around, but perhaps another baker out there can help. 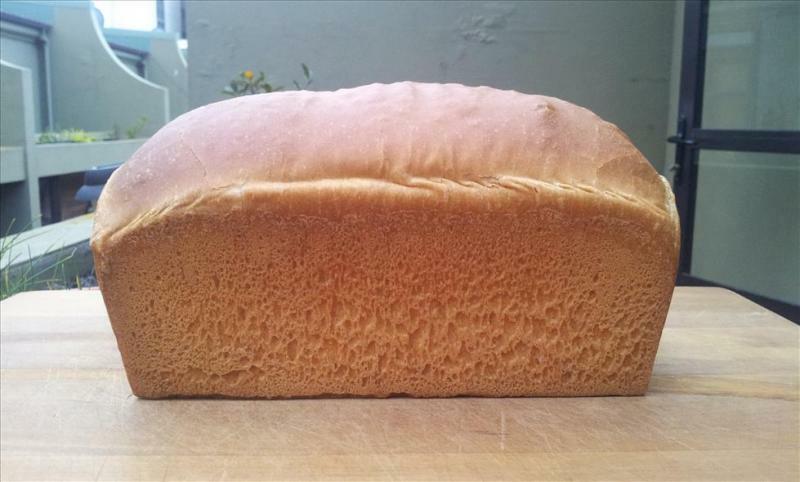 I made this lovely loaf once, and it was a hit with the kids (of course), and now I am on a mission to make a larger loaf. This quote from the recipe has me confused: "total flour is 250g, fit my Chinese small-ish pullman pan. For 8X4 US loaf tin, I suggest to use about 270g of total flour. For KAF 13X4X4 pullman pan, I would suggest using about 430g of total flour." This seems to tell how to make a bigger loaf, but (here comes the potentially ignorant question) do I just calculate the other ingredients to allow for the increased flour? I've been baking 10+ years, so I feel silly about this, but insight is most appreciated! Absolutely perfect! I usually mill at home and go all whole grain sourdough BUT every now and then I just need to make a white bread loaf! Usually I only do half and half but I went all out this time :) I doubled your recipe for my full size US Pullman pan and I used 2 egg whites and one full egg to equal the proper amount... it was perfect!! Absolutely shreddable and absolutely delightful. Long, cold 18 hour ferment overnight, about a 5 hour final rise/proof and bake and just delightful! I'm brand new to baking. I have a starter and I fed it and allowed it and allowed it to rise, reduced by half, then fed and allowed it to rise again. Everything looked great and appeared to be the same as any pictures I found for a healthy starter. I then attempted this recipe. I combined 13g of starter, 22g of Milk, and 41g flour. The mixture seemed very dry. 12 hours later, there has been basically no change to the levain. I'm assuming it is supposed to rise, but it as not. Any guess as to what I may be doing wrong? but it didn't come out soft and velvety at all and I was wondering what I did wrong. Hello! I live in TX and the location of my fermentation for levain and bulk fermentation is 81 degrees ambient. I know this will change my fermentation time dramatically and I have no idea what to look for as far as readiness in a firm levain. About how long do you think this should that take? Does anyone have a baker's formula for this recipe? I am so confused. If there were a formula there I think I could scale it up and down much more easily, but I'm having a hard time converting it into a percentage myself. 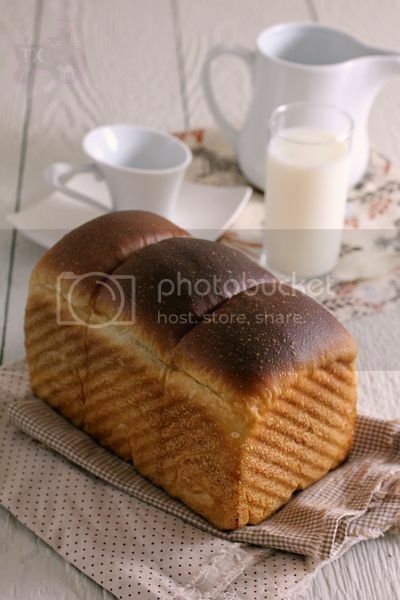 Txfarmer, your bread is so beautiful. I just need some help getting started. Note: The “% Water” column shows what percentage of water is in that particular ingredient, and I use it to calculate how much that ingredient adds to the overall hydration of the dough. Excellent bread. I'll admit, I tried this recipe hand kneading four times before I gave in and got a mixer with a dough hook. All worth it for this fluffy loaf! Question: has anyone modified this recipe to add grains or seeds? Hello! Thank you for the lovely recipe. Your pictures are no longer working. Are you able to re-upload a few? -I want to add cheddar cheese and herbs. At what stage, would you say? -Would adding powdered milk be useful? I have a large amount on hand at the moment. This is delightful, and I am working on making this bread. I was working on my own take with some whey, skim milk powder and oil. I was doing it at 96% hydration and while kneading gave up and readjusted the flour to make the hydration 75%. I often save the aquafaba from canned beans as it has been the most amazing new vegan ingredient and works like egg whites in every way. Stupid me forgot to defrost some, so this will be without the "egg" I Hope it works. Ill finish this version of bread and then keen to try this. Has anyone else used aquafaba in brioche or even heard of it? I used a rye and seed grain for my starter feed, 110g per 450g flour, except i added another 120 gm flour and some coconut flour.. so very experimental - Will let you know. My mouth is watering just from reading txfarmer's post and your comments. It's a shame I can't see the pics in the original post. Is anybody able to see them? I have baked the soft sourdough sandwich bread, that is supposed to be shreddble, soft and velvety. I am pleased and disappointed at the same time. What should I have done, when the dough didn't come together? hello TxFarmer, I have a question about the ingredients. I don't want to use sugar because of it is not organic. Can I use honey (or something else)instead of sugar? If I can how many gram? after 2 hours bulk at room temperature- it says punch down the dough and put into fridge. does it mean i need to complete degass the dough after it rise at rt and before put it in the fridge? and if i really need to degass, so why let it rise in the first time?